Laboratory experiments suggest that calcifying developmental stages of marine invertebrates may be the most OA-sensitive life-history stage and represent a life-history bottleneck. To better extrapolate laboratory findings to future ocean conditions, developmental responses in sea urchin embryos were compared under realistic in situ exposures in vent-elevated pCO2 and ambient pCO2 conditions. Echinometra sp. C were spawned in 7 separate experiments. 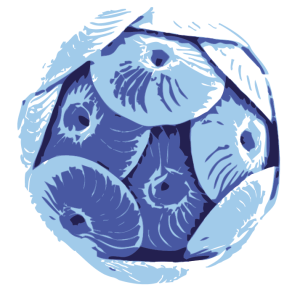 Embryos were transferred to replicated 50 mL plastic/meshed chambers moored in arrays at elevated-pCO2 reef environments near natural CO2 vents (Upa-Upasina and Dobu Reefs, Papua New Guinea; pHT ranging from 7.70 – 7.92, 560 – 1193 ppm pCO2) or an adjacent ambient-pCO2 location (pHT: 7.99-8.11, 414-453 ppm pCO2). After 48h, embryos were retrieved, and survival, normal development, and larval morphology quantified. Reciprocal transplants (embryos from vent-inhabiting adults were transplanted to control conditions, and vice versa) were also undertaken to identify if acclimatisation of adults to high pCO2 can transfer resilience to embryos (i.e. transgenerational processes). Seawater carbonate conditions over the course of the experiment were quantified. Compared with controls, embryos developing in elevated pCO2 vent conditions displayed only subtle detrimental responses. Several measures of size (e.g. total length, body width) showed significant variation among experiments, and decreased with pH/pCO2 at only one of the locations. In contrast, abnormal development (% asymmetry) consistently increased with increased pCO2, decreased pH or aragonite saturation state across locations and experiments. In addition, there was no indication that embryos originating from vent site adults were more tolerant to reduced pH. The increased abnormal development in embryos exposed to elevated pCO2 in situ is consistent with laboratory observations for embryos of Echinometra and other species of sea urchins. Effects on size were absent or inconsistent across experiments, and thus much less prevalent compared to the laboratory on a congeneric (Echinometra sp. A) or other species. Differences may be that embryos are more resilient under natural conditions, but it is also possible that pH effects in laboratory experiments are density-dependent as suggested for other echinoid species. While logistically demanding, in situ experiments provide a further and independent test of the degree that key developmental stages respond to reduced pH.